The BOMBERG brand, and the philosophy underpinning it, were developed two years ago and launched in November 2012. Encouraged by its immediate success on the Mexican market, this Swiss brand will première three lines, or some 50 designs, on the international stage in Basel. On the one hand BOMBERG is distinguished by the excellence and distinctiveness of its timepieces, but also by a new branding policy based on involvement of its suppliers and distributors in the brand’s success on the other. The brand’s policy also includes a novel approach to customer service, a superior production strategy and an innovative design concept. BOMBERG timepieces are aimed at real, straightforward and daring men looking for a positively unique design. Neuchâtel, 14 March 2013. BOMBERG’s integrity lies in its mission to manufacture a quality timepiece for a wide, discerning client base on the one hand and, on the other, in sharing its success with its partners through a paternalistic relationship. The concept of family is one of the main strands in the brand’s DNA. Its collections, its vision and its values have a core aim, summed up by the six constituents in its mission statement: loyalty, availability, excellence, challenge, and success. 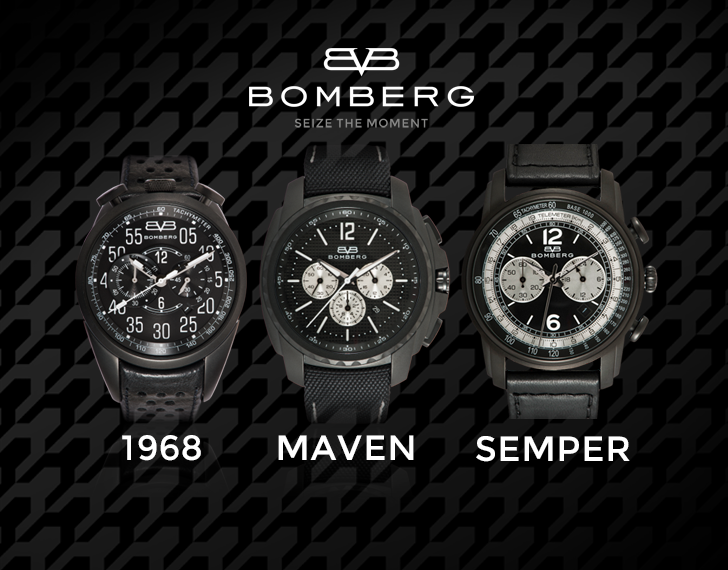 “Being a BOMBERG partner means that you share our philosophy and are part of our family. In return, we offer our partners an unprecedented level of service, which is why we are going to Basle with a collection ready to be delivered to our clients tomorrow”, explains Luís Rocha, BOMBERG’s CEO. BOMBERG collaborates with carefully selected design, development, production and distribution experts, who meet Swiss standards, throughout the world. Encouraged by its immediate success in Mexico, BOMBERG is currently developing its distribution in Colombia, Venezuela and Panama. It furthermore plans to penetrate the rest of Latin America in 2013, as well as the Middle East (UAE, Saudi Arabia), Asia (Japan, South Korea, Singapore, Malaysia, Thailand and Indonesia) and Europe. The sense of family associated with the brand and its colleagues can also be found in the designs which come in pairs (available as 44 and 39 mm calibres), meant to capture and mark a special moment in time with a loved one. Every model comes with a two-year warranty. The design criteria are informed by the desire for originality and unconventionality of the brand’s target market, its eagerness and impulsiveness. The paradox of a sharp appearance, black and smooth all at once, polished lines, asymmetric protruding case, fitting perfectly the ergonomic of the wrist. The collection includes 22 models. Maven Distinctive robust and solid case with integrated crown and push buttons. The collection includes 16 models available, chronograph or automatic. Movement: Chronograph (Miyota OS25) or automatic (Miyota 8215) with retrograde 1/20 sec. Semper The neo-classical. With a contemporary touch and vintage at heart. The collection includes 14 models of chronograph movement.